"Akiba-chan" redirects here. For the anime, see Akiba-chan (anime). Akiba-kei (Japanese: 秋葉系) or Akiba-chan (アキバちゃん) is a Japanese slang term for Akihabara style. Akihabara is a district in Chiyoda, Tokyo where many otaku, or obsessive anime, manga, and video game fans gather. 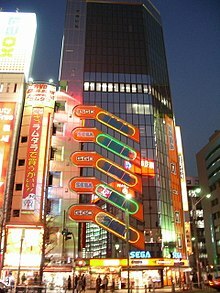 Akiba-kei is a Japanese slang term meaning "Akihabara style". It dates back to the early 80s and refers to a subset of otaku who spend much of their time in and around the Akihabara area of Tokyo and are known for their strong interest in "fantasy worlds...anime, manga, maids, idols, and games". Akiba-kei have also been characterized as being "interested in ruminating about domestic items and creating fan works based on these existing elements." The Akihabara area in central Tokyo is well known as a marketplace of cutting edge technology. In recent years,[when?] it has developed strong ties to the Japanese gaming industry, as well as to anime and manga publishers. In addition to patronizing the famous electronics stores around them, Akiba-kei frequently open their own shops in Akihabara. Many of these shops are run by Akiba-kei in cosplay, who may claim that such attire is the rule for them rather than the exception. The shops offer a wide variety of goods and services: some sell model or ornamental weaponry; others are modeled after antique reading rooms; and still others sell quirky or innovative foodstuffs. One distinctive feature of Akiba-kei within Japan's larger popular culture is that for the most part they belong to an older generation, who are well-versed in the history of Akihabara before it ever became a center of pop culture. Some of them, affectionately known as "Akiba historians", have worked in and around the Akihabara area for decades and witnessed firsthand the changes the area went through. In addition to running shops and participating vigorously in Akiba-kei culture, they may also be fonts of knowledge about Akihabara and its environs in ways that relate particularly to their areas of interests. In early 2008, a project was undertaken to attempt to merge some aspects of Akiba-kei culture with Shibuya-kei, Japan's "super-chic internationalist music, fashion, interior, and design movement" that began in Japan in the 1990s. In writing about this project, W. David Marx of Diamond Agency's culture blog observed, "Instead of fighting technological change, Akiba-kei otaku skillfully use the internet as a way to discuss and consecrate their favorite cultural items and disseminate new works to their community. This has only made the subculture stronger. In the end, the Akiba-kei subculture has won a top spot in the contemporary pop landscape because its culture has been least affected by the last decade's democratization of media and the decline in the culture markets." ^ a b "Bukiya weaponry shop". Wikimedia Commons has media related to Akiba-kei.